9 October: Joseph Howe, Canadian Secretary for the Provinces, arrives on an “unofficial fact-finding expedition” and stays at a hotel in the Town of Winnipeg. Note: Joseph Howe’s wife was Catherine Ann Susan McNab, born 1808 to Captain John McNab, Nova Scotia Fencibles. Captain John McNab and his brother, Peter McNab, were possibly related to Dr. John McNab, great-grandfather of Sarah ‘Sally’ McDermot, the wife of HBC Governor William Mactavish at Upper Fort Garry. 11 October: The Canadian survey crew of Capt. Adam Clark Webb/ Webbe, who were about to trespass the outer limits of André Nault‘s farmland (his two mile hay privilege; Nault’s family was not Métis and did not speak English), are brought to a halt. Along with Nault, the men who confront the surveyors include his brothers Benjamin Nault (b. 1832), Romain Nault (b. 1838), and Jean-Baptiste Nault (b. 1827), his nephew Prosper Nault (b. 1850), and his cousin, Louis Riel (Métis, who spoke English, and reputedly ‘stood on the chain’). 15 October: The Globe reports on the Nor’-Wester of 21 September, noting A.C. Webb of Brighton, ON, had arrived at the settlement along with W.A. Farmer of Cobourg ON, Ferguson of Kingston ON, William Alridge of Huron County ON, Ellwood of London ON, and Steel of Liverpool, England. 16/ 18 October: Joseph Howe, Canadian Secretary for the Provinces, leaves. Meetings are organized by, and for, settlers at St. Norbert and St. Vital parishes. 19 October: At a public meeting in St. Norbert, settlers elect members to the Comité National des Métis, under president John Bruce, with Louis Riel as secretary, and including Paul Proulx (cousin-in-law of Riel), Amable Gaudry (who moved to ON, 1875? ), and Prosper Nault. At another public meeting in St. Andrews, at the Rapids schoolhouse, there is some dissent over Donald Gunn‘s proposal that McDougall should be welcomed to the settlement—the objectors apparently led by Capt. William Kennedy, seconded by ‘Mr. Hays‘ (possibly Edward Henry George Gunter ‘E.H.G.G.’ Hay). 20 October: William McDougall, Canada’s Lieutenant-governor designate for the temporary governance of Rupert’s Land (which Canada does not own), is reported as arriving at St. Cloud, south of Red River, with boxes of repeating rifles. 21 October: The Comité National des Métis creates a “Committee of Safety,” and tasks André Nault and about 40 other men with constructing a barricade (la barrière), at St Norbert, just north of the point where the road to Pembina crosses the Rivière Sale, to prevent William McDougall entering the settlement or sending in rifles. Nault’s men style themselves the ‘Patriotes.’ The Comité National des Métis sends a dispatch to McDougall warning him not to enter the territory without their permission. [The memorial & petition of the people of Rupert’s Land and North-West Territory, British America, to His Excellency, U.S. Grant, President of the United States. (Red River, NWT? : s.n, 1870? ), 3, states the Committee of Safety members followed the maxim the “resistance to tyrants is obedience to God,” resolved to use “force if necessary, ” and were imbued “with full power and authority, to raise and equip an army to defend our country against that lawless invasion” threatened by McDougall’s progress. 22 October: Hyman, a Canadian working as a tanner at St. Norbert, who admitted to being a spy, complains at Upper Fort Garry about the barricade and armed guards. 24 October: Louis Riel addresses the congregation at St. Boniface Cathedral, explaining the reasons for disallowing William McDougall’s entrance to the territory. 25 October: the HBC Governor and Council of Assiniboia meet with John Bruce and Louis Riel about the barricade; the Council can do little but hope for the best, as the two will not back down but agree to keep the councillors informed. William Dease is said to have some 80 men in his company, ready to oppose the Comité National des Métis. They attempt to “procure … peaceable dispersion” at the barricade, but do not succeed and instead at least twenty of Dease’s men defect to the ‘Patriotes.’ A number of the men do not appear to have been well armed, as Dease sought to obtain guns and ammunition from Upper Fort Garry. HBC Governor William Mactavish, however, declines to supply weapons. 28 October: William Dease has perhaps as few as “twenty or thirty men” who are native to the settlement and on whom he can call. Reportedly some of these are camped near Upper Fort Garry. The group has perhaps diminished in size because they were “entirely without provisions,” and were having to rely on the Canadian Party (through John Stoughton Dennis) for food (the infamous Canadian government salt pork / John A. Snow‘s supplies for the road building project, warehoused by ‘Dr.’ John Christian Schultz). 30 October: William McDougall reaches Pembina. A letter from HBC Gov. William Mactavish advises him to stay on the American side of the border. McDougall is nevertheless determined to continue towards Red River. 1 November: André Nault and guards at la barrière force William McDougall’s representatives, Captain Donald Roderick Cameron (son-in-law of Charles Tupper, ‘ex-officio’/ temporarily-not-elected member of the Canadian parliament) and Joseph-Alfred-Norbert Provencher (nephew of Joseph-Norbert Provencher, the former bishop of St Boniface), to turn back to Pembina. Afterwards, (16 November, Convention of 24) Louis Riel explains to James Ross that the fort was taken “To preserve it for the inhabitants of the country and in order that McDougall with his strangers should not come and establish himself there as absolute master.” Riel implies Gov. Mactavish (husband of his aunt-in-law, Sarah ‘Sally’ McDermot) was not opposed to the occupation of the fort. HBC Gov. William Mactavish is bedridden with consumption and complains that his small contingent of guards is incompetent. The Council of Twelve has formed, consisting of Pierre Poitras, Pierre Leveille/ Léveillé/ Le Vieller/ Levaillier/ Leveillee, Magnus Bernard Birston/ Burston (HBC Councillor of Assiniboia), François-Xavier Dauphinais Genthon/ Genton/ Jeanton, Ambroise-Dydime Lépine, Jean-Baptiste Tourond, Louis Lacerte, Pierre Parrenteau, “J.-B. Perrean” [sic: Perreau/ Perreault? ], Charles Nolin, “J.-B. Millet” [sic: Jean-Baptiste Millet dit Beauchemin? ], and André Beauchemin. The executive consists of John Bruce, President, and Louis Riel, Secretary. 6 November: The printing press and type of the Nor’-Wester newspaper are ‘seized’ to print a “Public notice to the inhabitants of Rupert’s Land,” published by “Representatives of the French-speaking population” under joint supervision of Louis Riel and James Ross, alerting settlers that a convention will be held Nov. 16. 9 November: The Notice is posted. An anonymous letter is sent to the Toronto Globe explaining the case of the “British subjects” of Red River against Canadian mismanagement (it was later printed). 16 November: The Convention of Twenty-four” (12 ‘English’ parish representatives and 12 ‘French’), begins a series of meetings at Red River. [See W.L. Morton, ed., document 8, translation, “Louis Riel’s Notes of the Sessions of the November Convention of English and French, November 16 to December 1,” Alexander Begg’s Red River journal: and other papers relative to the Red River resistance of 1869-1870 (Toronto : Champlain Society, 1956), 420-428. Prime Minister John A. Macdonald learns of the halt to the Canadian survey from American press reports. 17 November: Second day of the Convention of 24. 19 November: The Quarterly Court tries Thomas Scott, W.J. Allan, George Fortney, and Francis Mogridge (all of Canada) for an assault on 1 October, at Point du Chene, on John Allan Snow, their road-crew boss. Scott and Fortney are found guilty and fined. 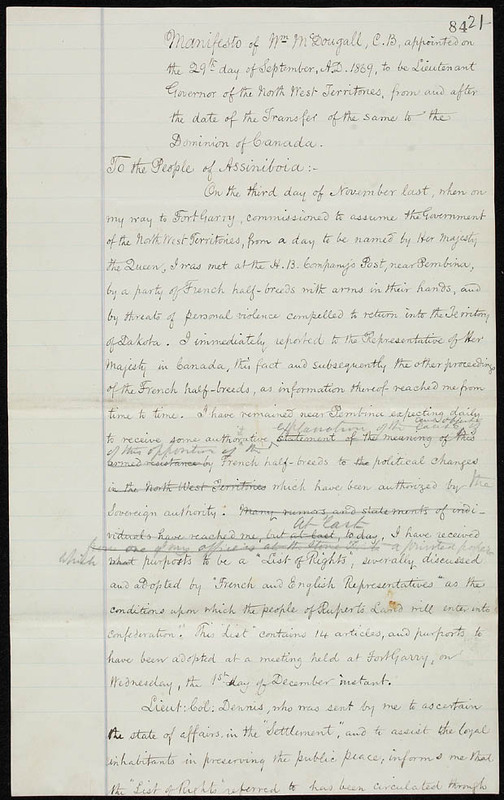 20 November: John A. Macdonald plans to send Father J.-B. Thibault and Colonel Charles de Salaberry from Quebec to Red River as good-will ambassadors. 20 November: “Thomas Bunn, one of the delegates on the English side, avowed his intentions openly to-day which were to stand up for the rights of the people which in a few words was a full and elective representation at the council board of the country. Maurice Lowman another delegate did the same thing as well as Mr. McKenney for the Winnipeg Town” [my emphasis]. 22 November: Convention of 24 resumes in Red River for the third day. Enos Stutsman, United States treasury agent at Pembina, arrives at Red River to “set up shop in the bar of Emmerling’s Hotel.” There, he regales patrons with tales of the frustrated would-be governor sent from Canada, William McDougall. 23 November: fourth meeting of the Convention of 24. A meeting is held, by the Town of Winnipeg delegates to the Convention of 24, at the Engine House to report and “to determine on the future action of the inhabitants of the Town of Winnipeg in reference to the present troubles.” Louis Riel attends as a speaker and is applauded. John C. Schultz and the Canadian Party also attend, but make derogatory comments to the chairman — A.G.B. Bannatyne — who responds by adjourning the meeting. 27 November 1869: A.G.B. Bannatyne reconvenes the meeting at Emmerling’s Hotel. The boundaries of the Town of Winnipeg are set “to extend as far as but not inclusive of Fort Garry on the South, as far as Mr. Alexander Logan‘s on the north, as far as the Red River on the east and two miles out on the plains from the river on the west side. William B. O’Donoghue “representing the Sisters” (the Grey Nuns, who had a new school house in the town), asks for “all householders, property owners and seven months residence be allowed the right to vote.” His motion carries, giving women — the Sisters at any rate — voting rights. 26 November: The Canadian government cables England, refusing the transfer of the North West until Canada receives a guarantee of peaceful possession. [John A. Macdonald, an alcoholic, was apparently on, or coming out of, a drinking binge at the time. See Spraque, Canada and the Métis, 43. See also Brian Bethune, “John A. Macdonald’s Tragic Life,” review of Patricia Phenix, Private Demons: The Tragic Personal Life of John A. Macdonald (McClelland & Stewart, 2007). 29 November: Allegedly, Objectors to a Provisional Government, including William Dease, send a declaration to “French Representatives” at the Convention of Twenty-four, voicing objection to instituting any provisional government — whether Canadian or locally led — and a preference to continue under the proprietary government of the Hudson’s Bay Company. 1 December: unaware that the date previously set for formal transfer has been moved back, and despite his original instructions to wait for official authorization, William McDougall prematurely announces his new gubernatorial power to the wind while standing out on the prairie. McDougall sends “The North-West Territories. Proclamation” to supporters in the settlement, and, in a separate document, commissions John Stoughton Dennis to raise an armed force to “attack, arrest, disarm or disperse the said armed men so unlawfully assembled,” with the help of ‘Major’ Charles Arkoll Boulton. 6 December: John A. Macdonald sponsors Governor-General Sir John Young‘s proclamation of amnesty for all in Red River if they lay down their arms. Father J.-B. Thibault and Colonel Charles de Salaberry are officially on the way to Red River. Her Majesty commands me to stte to you that she will always be ready through me, as her representative, to redress all well-founded grievances and any complaints that may be made or desire that may be expressed to me as Governor-General. 6 December: John Stoughton Dennis publishes his commission from William McDougall in the Settlement, with a notice attached calling upon all loyal men of the North-western Territory to help him. Preparations are underway for an attack on Upper Fort Garry (Dennis is at Lower Fort Garry with his men; [Boulton and Webb are at Portage la Prairie with their contingent?]). Lindsay Russell, chief engineer for Canada’s road project, issues a proclamation at Winnipeg “calling on all loyal citizens to protect the government property (the pork and beans in Schultz’s store).” About 45 Canadians respond, assembling in the store. 7 December: A.G.B. Bannatyne relays a message to John Christian Schultz, the Canadian Volunteers, and anyone else in the store, that they have fifteen minutes to surrender or face the consequences. They opt to surrender, are arrested, and jailed. John Stoughton Dennis flees the settlement for Pembina. 10 December: the Provisional Government is formally proclaimed in ceremony at Upper Fort Garry. A letter published in L’Evenement [dated 10 December?] describes the raising of a Provisional Government flag at Red River. Dec. 12 or 13? – Donald A. Smith leaves for Red River Settlement. 14 December: Louis Riel writes letter to Eustache Prudhomme, Montreal. c. 15 December [or earlier]: Charles Mair is arrested and jailed. 18 December: informed that Canadian annexation of Rupert’s Land has been postponed, William McDougall and John Stoughton Dennis leave Pembina for Ontario. McDougall takes with him the List of Rights formulated by the Convention of Twenty-four. 25 December: John Bruce resigns, Louis Riel becomes president. 2nd.– Mr. Francois Xavier Dauphinais has been chosen Vice-President. 3rd.– Mr. Louis Schmidt has been appointed Secretary of the council. 4th.– Mr. W.B. O’Donoghue has been appointed Secretary-Treasurer. 5th.– Mr. Ambroise Lepinr has been appointed Adjutant-General. 6th.– … that Mr. A.G.B. Bannatyne should be continued in his position as Postmaster. 7th.– All the officers or employees of the old government who might pretend to exercise that old authority shall be punished for high treason. 8th.– Justice shall be administered by the Adjutant-General, whose council shall be composed of Mr. A.G.B. Bannatyne, F.X. Dauphinais and Pierre Poitras. This council will sit on the first and third Monday of each month. 9th.– All licenses for the sale of intoxicating liquors must be given by the Adjutant’s council, and all those who took this kind of license on the 1st December last, must have them renewed by the said council. Dec. 27? — Donald A. Smith arrives in Red River Settlement with Richard Charles Hardisty. New York Times (30 December 1869).